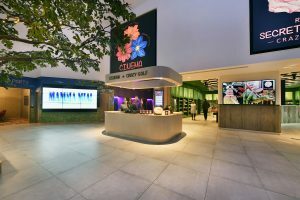 Nature and technology merge at Lancashire’s new and original leisure destination, The Flower Bowl, incorporating over 30 wayfinding and entertainment screens supported by easy access video wall mounting solutions from AV technology pioneer Peerless-AV®. AV equipment supplier and integrator TVC Technology Solutions, was responsible for the installation, creating a fully integrated audio and visual experience for visitors to this latest must-see attraction located adjacent to the existing Barton Grange Garden Centre at Brock, Preston. The brainchild of the award-winning Barton Grange Group of companies, The Flower Bowl is a unique, single-story, mixed leisure and attractions venue, including a curling rink, ten pin bowling alley, crazy golf course, golf simulator and multi-screen cinema all under one grass-covered roof. TVC began initial discussions with Barton Grange Group in October 2016 to help create this most impressive and unusual leisure venue, which sees AV technology integrating seamlessly with its surrounding natural environment. Completed at the end of 2018, The Flower Bowl is now officially open to the public. TVC specified and installed a total of 19 x 32″ and 55″ Samsung Hospitality and Commercial LFD screens in high visibility areas of the venue for wayfinding and information sharing with visitors. A further 17 x 46″ Samsung screens are used to create striking video walls. In the main foyer, located outside the entrance to the cinema, is the larger 3×3 video wall used to display the latest movie trailers. Two smaller 2×2 video walls are positioned at the entrance to the shop, showcasing the Secret Garden Crazy Golf, and the Private Bar and Karaoke area. To provide easy access to all screens and to deliver the most professional screen placement for the individual displays and video walls, TVC chose Peerless-AV DS-VW765-LQR SmartMount® Full-Service Video Wall Mounts with Quick Release. Speciﬁcally designed with a gentle pop out mechanism for quick service access, even for in-wall applications, the Peerless-AV mounts provide an ideal video wall mounting solution for displays up to 65″. These award-winning mounts are packed with installer-friendly features that allow for a single person install, including an easy hang keyhole wall plate for fast mount positioning. The tool-less micro adjustment at 8 points ensures precision display alignment, while the custom wall plate spacers provide perfect placement of each additional mount on the wall, eliminating installation calculations and guesswork. Compact, lightweight Canon short throw projectors are installed within the curling arena to project eye-catching winter scenes through a virtual window to the outside world. Finally, a series of BOSE ceiling and wall mounted speakers help create the perfect acoustic atmosphere throughout the venue. For more information about Peerless-AV products and solutions, visit www.peerless-av.com. Follow the latest news and updates on Twitter, Facebook, LinkedIn, and blog.